How to use Nano Spanish Club as a resource to learn Spanish at home. One of our members shares her views and experience. How old is your child/ children? 2 years old. What was the main reason that made you sign up for Nano Spanish Club online resources? Working full time, there aren’t many classes for early years on the weekends and our nursery doesn’t have an interest to have Spanish classes so the online solution was perfect as we learn Spanish together. 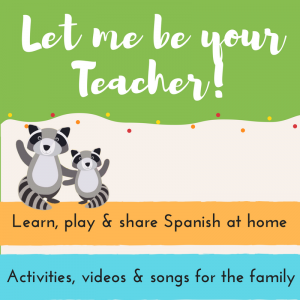 What feature of Nano Spanish Club do you and your child/ children use more often, educational videos, images and words or print out worksheets? The videos mostly and the images and words. We like the worksheets but it requires planning ahead to print it out. How often do you use the resources? I try and watch the videos with my daughter around 3-4 times a week. How easy is it to use for your child/ children on his/ her/ their own? from 1 (very difficult) to 5 (very easy) – 2 – given her age but she does try and click on the screen to view more. Would you say your child/ children is learning and making progress with our content? Yes! She is slowly speaking Spanish but compared to English and Korean she doesn’t have as much exposure. From 1 to 5 how much fun is your child/ children having when using Nano Spanish Club? (1 not fun at all, 5 great fun) – 5. She loves Nano and Panchito. I like the use of songs as it does help many of the words stick! Do you access our membership content on a tablet, phone, computer or device connected to the TV? Usually a phone but will try and use our tablet. Are you as the parent/ adult learning together with your child? Yes, my husband is from Spain so he is fluent. I studied Spanish years ago but better with reading and writing than conversationally. We are very grateful for all users feedback, we have recently added Closed Captions to all our songs in level 1( level 2 Closed Captions coming soon) as suggested from one of our members. We are committed to offer a great resource to help your little ones learn Spanish with us, so if you have any suggestions, please tell us, What are you looking for? Comment below and I will be more than happy to help. To have a look at what our membership can offer visit us here and if you want to attend one of our classes here is where we are teaching.